Habitat: Gotu Kola is native to India, Japan, China, south Africa and south Pacific. Grows in low wet areas. 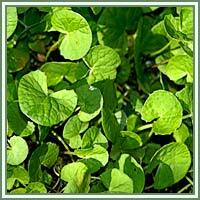 Description: Gotu Kola is herbaceous, perennial plant. It has long-stalked, fan-shaped green leaves, and very small, light purple to red flowers, born in an umbel from the stem nodes. Fruits are also small, and oval in shape. Useful components: Vitamins A, B, C and D, volatile oil, calcium, chromium, cobalt, magnesium, manganese, phosphorus, sodium, potassium, selenium, silica, zinc. Medicinal use: Gotu Kola is considered to be an adaptogen, antibacterial, antifungal, antioxidant, anxiolytic, diuretic, digestive, nervine, and vulnerary. 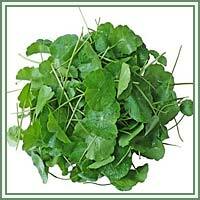 Gotu Kola is excellent in treatment of varicose veins. It can help reduce swelling, repair connective tissues and improve circulation. It increases keratinisation, and appears to be very helpful in wound healing, treatment of bruises, sores and ulcers. It is one of the most valuable herbs in Ayurvedic medicine, because it revitalizes nerve and brain cells, increases memory and concentration, and has an overall rejuvenating effect on our body. It enhances metabolic processes, and is often referred to as an “elixir of life”.